Authentic version of Dhokla uses rice and bengal gram or urad dal which are soaked overnight, ground to a batter, spiced up with ginger. Here I tried healthy version with lentils – Green Moong Dal, yellow moong dal and Red lentils. Green gram dal and moong dal are both derived from the mature mung bean. High in fiber as well as other nutrients, green gram dal is a low-fat source of protein. Wash and soak green gram, yellow moong, red lentils for atleast 5-6hours. After soaking time rinse again and drain thoroughly. Meanwhile heat little water in a large pan. Grease the 7 or 8” vessel or cake pan, pour the batter and place the pan in the pan- steam cook for 12-15 minutes /until the tooth pick inserted comes out clear. Heat oil in a small pan add mustard seeds as it crackle, add sesame seeds saute for few seconds. Add the green chillies. curry leaves and saute on a medium flame for few more seconds. Pour the tempering over the prepared dhoklas and spread it evenly on top. Cut into pieces and serve hot with Mint Chutney. Make sure not to add more water while grinding. And the batter should not be too thick OR too thin. 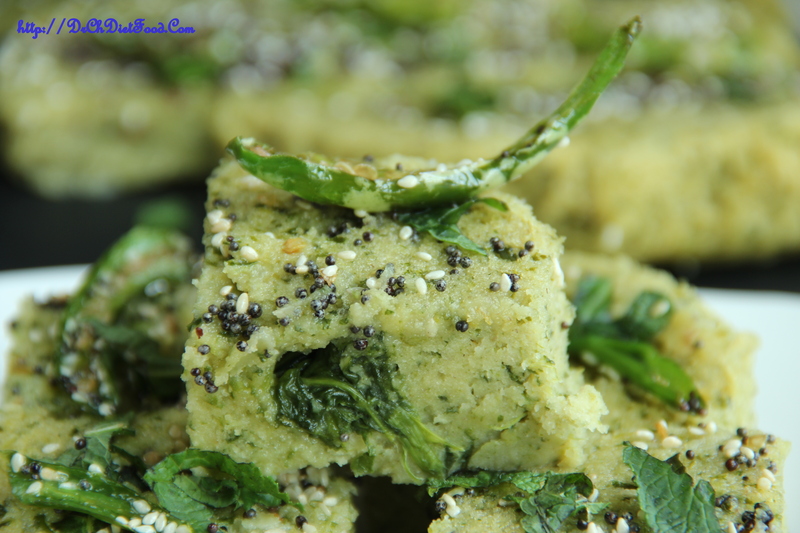 Posted on May 27, 2015, in Indian, Starters, Vegan and tagged gluten free Dhokla, healthy Dhokla, healthy easy indian starter, Instant dhokla, mixed dal dhokla, moong bean dhokla, Moong dal dhokla, no-fermenting dhokla, red lentils/masoor dal dhokla, spinach/palak Dhokla, steamed indian easy starter, steamed lentil dhokla, vegan dhokla, yogurt free dhokla. Bookmark the permalink. 33 Comments. 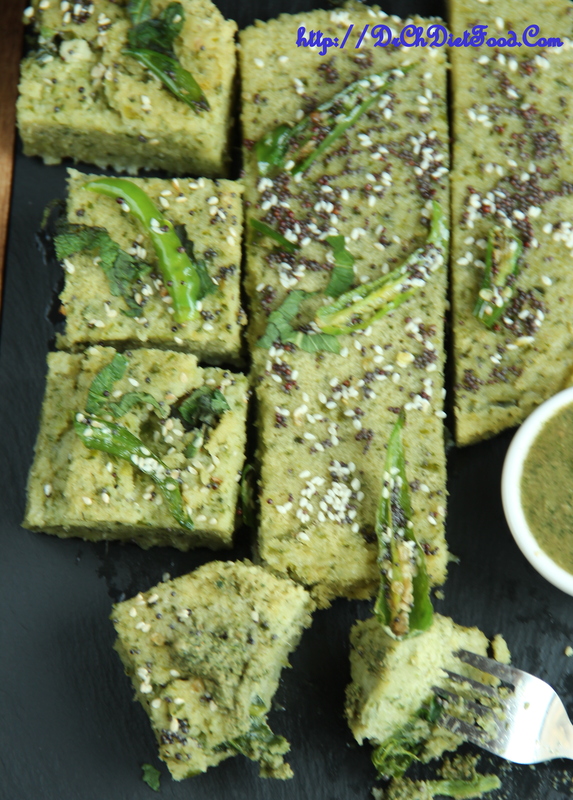 Looks great.. love the usage of spinach in dhokla. I really like your recipes. I love indian food and seems like a great vegan choice. Will try soon! Thank you Maleeke. … glad you liked it…. please let me know when you get to try…. I like that this is steamed. I imagine the texture is really nice. Pinned! I am so making this. I would love to add rice though and I am sensitive to red lentils. Do you think I can replace red lentils with rice? This recipe I have to try. Thanks so much for this, Chitra. Thank you Aruna…. my pleasure…. So nice of you Ady. Great to hear that you have liked and sharing with mum.. 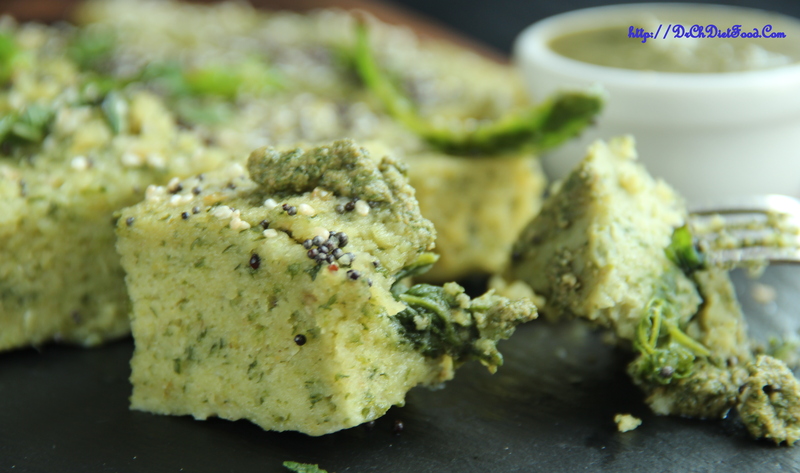 Wonderful, this is one unique nutrition filled dhokla recipe. Looks great too. Dfly trying it. Thank you dear Apsara. …await to hear from you…. 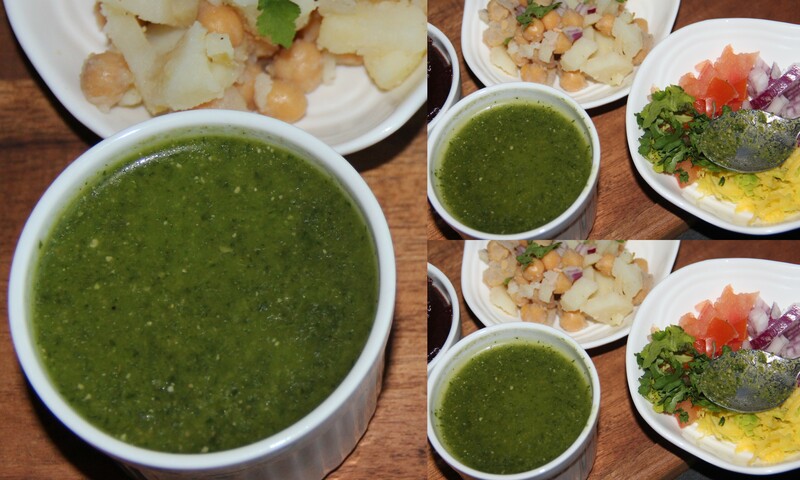 Very healthy recipe Chitra..Loved the addition of spinach too.